The Quad Cities River Bandits and Main Street Amusements are pledging at least a $50,000 donation this year to the Genesis Health Services Foundation, benefiting Camp Genesis, Genesis Neonatal Intensive Care Unit and Genesis Flu-Free Quad Cities. Dave Heller, owner of the River Bandits, and Ken Croken, Genesis Health System Vice President, Corporate Communications, Marketing and Advocacy, made the announcement at press conference Wednesday at Modern Woodmen Park. For each ride of the new amusements at Modern Woodmen Park - including the 105-foot Ferris wheel, the expanded 300-foot zip line, Space Camp and the Mediacom Drop'N Twist, 50 cents will be donated to Genesis Health Services Foundation health initiatives for children. 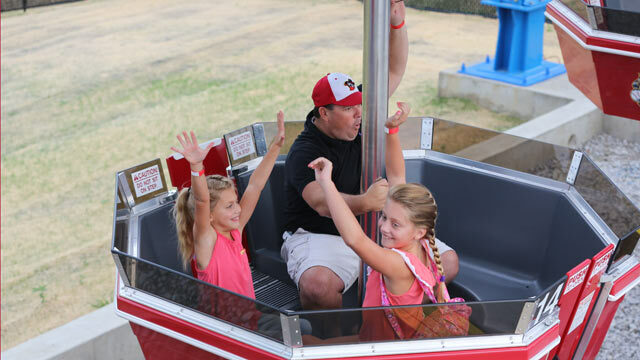 Since the Ferris wheel opened May 24, approximately 30,000 people have taken rides, but the River Bandits ownership will personally make up the difference for a total donation of at least $50,000. "The amusements at Modern Woodmen Park have brought great joy to thousands of families in the Quad Cities region this summer, and we are blessed to be able to use these rides to help some of the less fortunate families in our community," said River Bandits owner Dave Heller. "We are thrilled to be able to partner with the Genesis Health Services Foundation to ensure that affordable, family-friendly fun at Modern Woodmen Park makes a lasting impact for families across the region." The donations will go toward the Flu-Free Quad Cities campaign, Camp Genesis for kids who have someone close to them with cancer and Genesis Neonatal Intensive Care services to help struggling newborn babies. The 105-foot Ferris wheel, Mediacom Drop'N Twist, Space Camp, and 300-foot zip line are open during all River Bandits home games, normally beginning 90 minutes before the scheduled first pitch. The rides are also open every Saturday morning - weather permitting - from 9 a.m. to 1 p.m., as well as weekend non-game days: Fridays 7 p.m. to 10 p.m., Saturdays and 7 p.m. to 10 p.m., and Sundays 1 p.m. to 5 p.m. Fans may purchase special tickets that can be redeemed at amusement areas, including the Ferris wheel and Bounce QC Kids Zone. Tickets are sold at $1 each, 5 for $5, 12 for $10, and 20 for $15. No tickets are required for children three years and under. An all-you-can-ride-and-bounce daily pass is $20, and a season pass for unlimited rides and play in the Bounce QC Kids Zone for $49. Purchases can be made at the amusement areas of Modern Woodmen Park. UP NEXT: Gates open at 5:30 p.m. on Pay Your Bill Wednesday presented by U.S. Bank and Mix 96. Two fans will have their bills paid up to $100 by the River Bandits, and for Ninja Turtles Night, fans who wear a Ninja Turtles shirt will receive $1 off the regular ticket price, and fans in a Ninja Turtles costume will receive $2 off the regular ticket price. Thursday is the Craig Biggio Bobblehead giveaway presented by Prairie Farms and FOX18, along with $2 drink specials on a Thirst-Day presented by the River Cities' Reader. The homestand continues through Sunday. Tickets are available at www.riverbandits.com. ABOUT THE BANDITS: Having just been named Ballpark Digest's winner of Best Ballpark Improvement in America under $1 million, the River Bandits ownership recently made one of the biggest improvements to Modern Woodmen Park since the ballpark was first built back in 1931! A new Ferris wheel, standing 105 feet over the playing field, opened May 24, and Space Camp opened June 20; the newly expanded 300-foot long zip line has also reopened. In 2013, the team unveiled a new 220-foot long dual zip line, a rock climbing wall, and a number of new bounce houses. Last season, the team's major league affiliate, the Houston Astros, saw all six of its affiliates reach the playoffs - the first time in a decade any MLB team can claim such success. The River Bandits were one of three affiliates to reach the championship round and one of two to win their league championship.